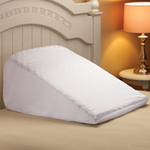 Wedge pillow case is machine-washable 50% polyester/50% cotton. 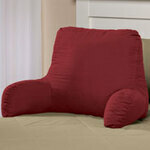 Our wedge pillow case is designed to fit the Comfort Wedge Pillow. 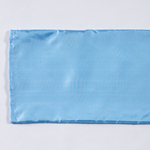 Pyramid-shaped book pillow with attached bookmark holds books and tablets at a comfortable viewing angle for hands-free use anywhere. Ledge keeps materials in place. Spot clean. 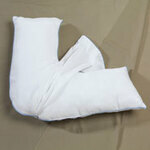 Polyester/polyfill. 12"sq. 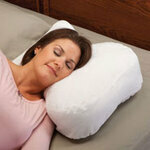 x 8"H.
…pillow wraps your entire body for support as you sleep. 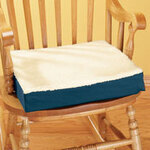 Proper support can help relieve joint pain, post-surgery discomfort, even fibromyalgia symptoms. 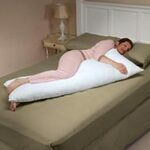 Ideal for pregnant women, too. 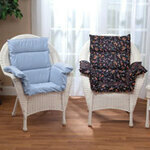 Hypo-allergenic polyester wth poly/cotton cover. 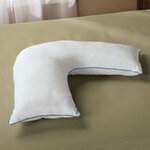 Pillow 102" L x 15" W. Made in USA. 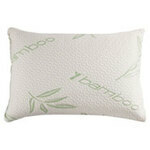 No express shipping on pillow. 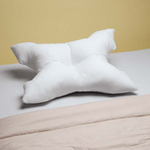 This L-shaped pillow cover goes over our unique L-shaped pillow. 100% polyester. 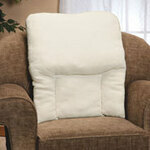 Fits pillows 48"L x 10"W x 7"H. Removes for easy cleaning. Spot clean.